What is your favourite annual climber? Most of these climbers grow 6-10 feet in one season. 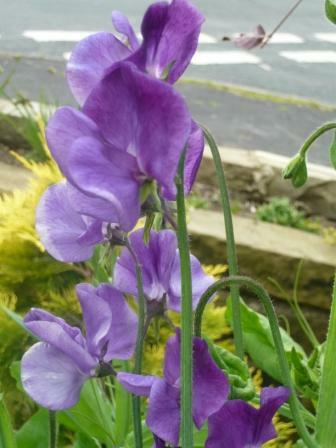 Sweet Pea lathyrus odoratus must rank near the very top of any list of favourite annual flowers. they will grow 6-10 feet tall and if the flowers are picked regularly they will give endless scent and pleasure. Cathedral Bells Cobaea scandens may be half hardy perennial but it is best grown an an annual each spring for the purple veklvety bell shaped flowers. Caiophora lateritia Frothy has 2″ wide flowers that turn from coppery orange to white and grows 4′ tall. Black-eyed Susan Thunbergia alata has yellow or white flowers with the charecteristic dark brown eye. Nasturtium Tropaeolum majus grows in poor soil and flowers in a variety of colours. The seeds leaves and flowers can be eaten as a bonus. Canary Creeper is also from Tropaeolum family Peregrinum and as the name implies it blooms with irregular yellow flowers. Climbing Snapdragons Asarina antirrhiniflora is tender but has purple or white snapdragon like flowers and grow 4-5′ tall. Lophospermum scandens also looks like a snapdragon with nlarger more colourful flowers.